Published August 19, 2015 By Anna T. This post may contain affiliate links. Regardless, I only recommend sites I've researched and/or used and trust. SmartBrief is a company with regular openings for freelance writers. This company is in the business of creating email newsletters for specific industries, containing the most relevant industry news for executives and professionals who work within those industries. I frequently see opportunities to write short news articles for SmartBrief listed on the job boards I visit, so today I did a little digging around to find out some additional info on this writing opportunity and share it with you here. It looks like SmartBrief's writing opportunities are open only to US residents. As the title of this post suggests, you are not writing long, involved articles for SmartBrief. All they want are extremely condensed versions of current industry news stories to be included in their email newsletters, usually no more than two sentences. If hired, it will be your job to find relevant, current news stories that may be of interest to their subscribers, summarize them, and then create the email newsletters. How much does SmartBrief pay? Like many companies, SmartBrief chooses not to share their rate of pay publicly. Still, sometimes I'm able to find the information anyway with enough digging around. Glassdoor allows workers to share their salaries anonymously, and I went to SmartBrief's salary page on there and saw where someone who works as a freelance, hourly contractor (I'm assuming this is probably the writing work) claimed to be making $14 hourly. SmartBrief is looking for skilled writers with knowledge of the Associated Press style who can write quickly and meet deadlines. 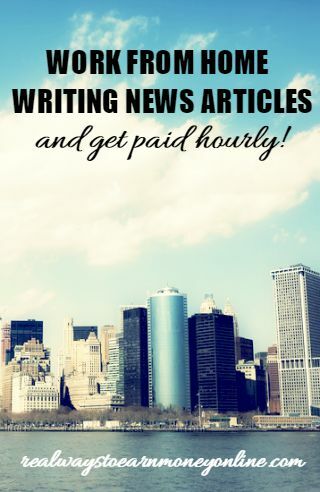 They also want writers who are really good at finding news stories and other information on the web with a general understanding of various online publishing tools. If you apply and they consider your application, you'll be given a timed writing test to ensure you can write quickly. You're looking for very recent, relevant industry news articles to condense and send out, so this is very deadline-oriented work. For this reason, SmartBrief's writing opportunity is different than many others I've shared. They are usually looking for writers to work in shifts. I often see their job postings advertise that they need writers for morning shifts (overnight through 5 a.m.). If you're looking for writing work at home because you need something flexible, SmartBrief may not be the opportunity for you since you are tied to working during specific hours. What do other workers say about writing for SmartBrief? I tried to use Glassdoor to find this information as well, but it looked like most of the reviews there came from people working onsite. Most of those reviews were a little mixed, for what it's worth. When SmartBrief is hiring, you'll see the openings listed directly on their website here. You'll be asked to upload a resume/CV when you apply. Good luck if you decide to go for it, and please keep us updated on how it's going if you get the job. Want to Go Into Business For Yourself? Check Out This FREE List! This is the most profitable route to take as a freelance writer. You can get your own clients and set your own rates, which you cannot really do with SmartBrief and sites like it. A six-figure income is not outside the realm of possibility when you're running your own business. Not sure what you'd write about? I recommend grabbing a copy of Gina Horkey's FREE list of 200+ writing niches to consider! She's also written an incredibly detailed guide on working for yourself as a freelance writer if you're interested in getting a lot more information on how to go about it.